Accommodates 10 or 20 each, 14" x 18" or 15" x 20" trays, end loaded one per ledge. Door opens a full 270 degrees for unobstructed access and contains a hold open device. Paddle door latch assures positive door closure. Recessed vertical push handles on both ends of the double component model and on the rear of the single compartment model. 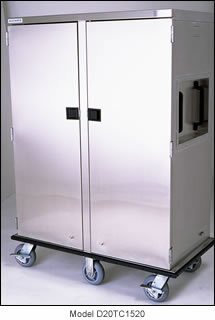 Cart body and removable stainless steel tray slides are easily cleaned and sanitized. Compartment floor drain facilitates interior cleaning. Perimeter bumper protects walls, furnishings and doors. 18 gauge stainless steel body and doors. 16 gauge stainless tray slide with 14 gauge uprights. 16 gauge bottom and top. Double door pan door with 1" rigid fiberglass insulation for sound deadening. D10TCEL 10 ea. 14"x18" or 15"x20" 5"
D20TCEL 20 ea. 14"x18" or 15"x20" 5"